A floor pillow or pouf is a great way to add casual seating to your home. They can be made in any size, many different shapes, and can be quite plain, or have some great trim or fringe! A pouf is just a taller version of a floor pillow, usually round. 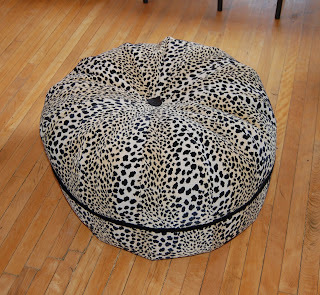 I had 2 yards of some beautiful leopard print cotton velvet that I decided to use for a pouf. I wanted to be really substantial- more of a piece of furniture than a pillow. I cut 24 wedge shaped pieces- 12 for the top, and 12 for the bottom. The angled part forms the flat top or bottom, and the straight wide part of the wedge forms the sides. One half: all 12 pieces sewn together. They didn't quite meet perfectly in the center, so I hand sewed the gap closed. The edges that curve under form the sides. The finished pouf! I inserted a solid black piping in between the top and bottom, and made sure the seams matched, leaving about a 14" long opening. 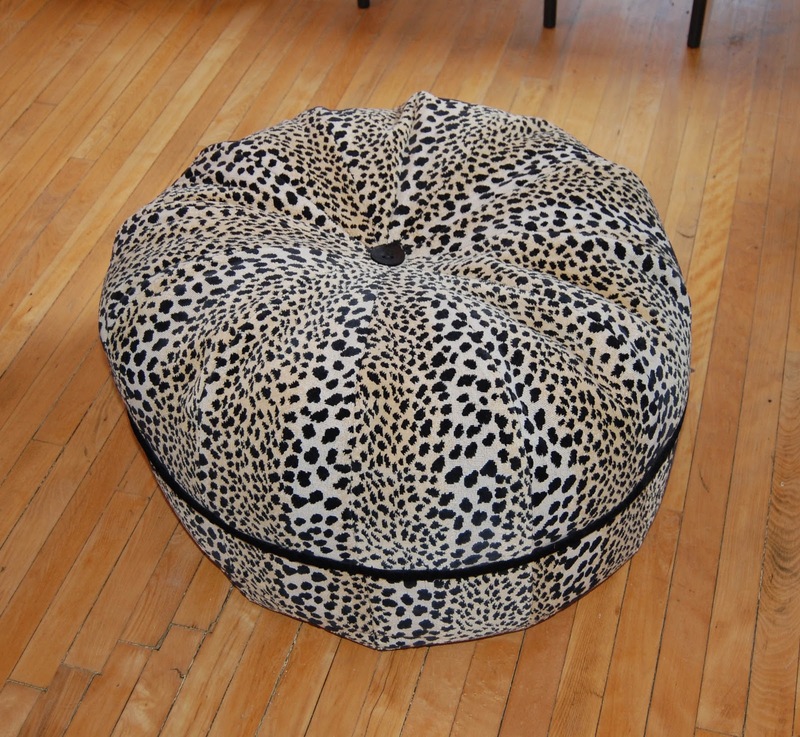 I stuffed it with halfway with some old down bed pillows, then sewed a button on top and bottom in the center, attaching them to each other to dent the pouf in the center. I then finished stuffing it, and hand sewed the opening closed. It's quite large, and is stuffed with 10 pillows! The one that is made in class will not be this big!